Welcome to Sarah’s Place No. 5 in Henties Bay. 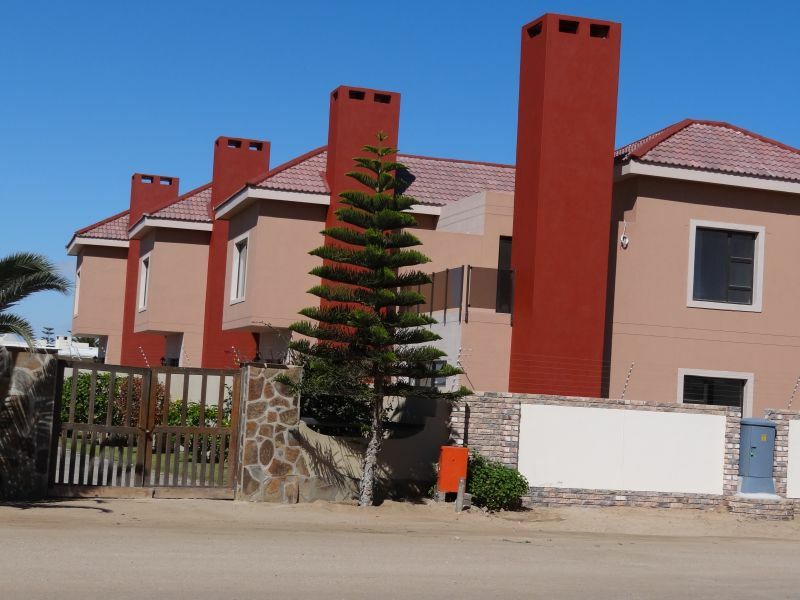 (Namibia Tourism Board Registration No: SEL00791) The facility is a 200m2 duplex luxury flat with 4 x two bed bedrooms (8 persons in total), 3 full bathrooms tiled to the roof, lounge, kitchen and double garage. The kitchen is equipped with a 4 burner gas stove, micro wave, electric frying pan, snack toaster, fruit mixer and all other kitchen utensils, cutlery and dishes. Three level security system: electric fence, outside beams and indoor alarm system 43" flat screen TV with full DStv and DVD player 10 minutes walk to the beach Inside barbeque Laptop desk Washing machine Chest freezer Bedding and towels (bring own towels for the beach) The price also includes a daily cleaning lady from 9:00 until 12:00 (Monday to Saturday). Cleaning services on Sunday and public holidays is extra. The cleaning services consists of cleaning dishes, sweeping floors and make up of beds. Price off season* : N$1,100.00 per night for the whole unit Price during season* : N$1,500.00 per night for the whole unit *season: 10 December to 10 January and 1 April to 8 April and 27 April to 7 May. Since this is a townhouse complex we cannot accommodate any pets. Visitors are expected to vacate the premises before 10:00 on the day of departure.